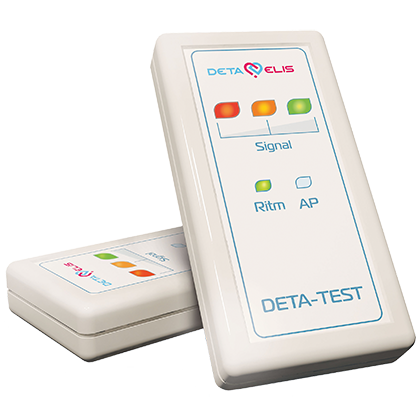 Buy DEVITA Test Device Online | DETA ELIS | Be Sure! This is a clever device that shows whether the DEVITA AP and RITM devices are indeed working with proper limits. It basically illustrates the intensity and the quality of the electromagnetic spectrums emitted by these devices. The DETA TEST simply tells the owner of the Deta-Elis devices whether they are working or not and whether they are in need of repair or a service. The operation mode of the DETA TEST is simplicity in itself. Simply turn the Deta-Test on while also turning on your AP or RITM device – the DETA TEST automatically picks up the device and shows a light on the panel. If the signal is green, the tested device is operating normally. If the signal is yellow, there is insufficient radiation efficiency (meaning the batteries likely need to be replaced). If the signal is red, the device is out of operation and should be repaired. Deta-Test easily determines the device’s status and whether it needs to be repaired. If the device is operating normally, you should consult your doctor and modify your recovery program. The reliability of “Deta-Test” has been tested and confirmed during batch checks of “AP” and “RITM” devices. The “Deta-Test” readings are valid only for “DeVita-Ritm М2” and “DeVita-AP М2” devices. The first and second models of the devices have different ranges of antenna circuits, and “Deta-Test” is designed only for antennas of the М2 models. Accurate results when testing the first models of the “DeVita-Ritm” and “DeVita-AP” devices cannot be verified.